In the late 19th and early 20th centuries merry-go-rounds or carousels were a popular form of entertainment in Jamaica, even perhaps a 'craze' in the 1890s. This page will provide a little information on this phenomenon, based on reports in the newspapers at the time. Daily Gleaner, May 26, 1928, page 12, in editorial on the amusement tax. So far, the earliest clear references to merry-go-rounds are found in 1887, but they must have been in use long before that, since no special comment is made on their presence then. In The Capitals of Jamaica, edited by W Adolphe Roberts, F L Casserly referred to a 'merry-go-round' at the Emancipation Day celebrations on the Kingston Race Course in 1838. What the source of this information is, or if the term 'merry-go-round' was actually used, is not clear. 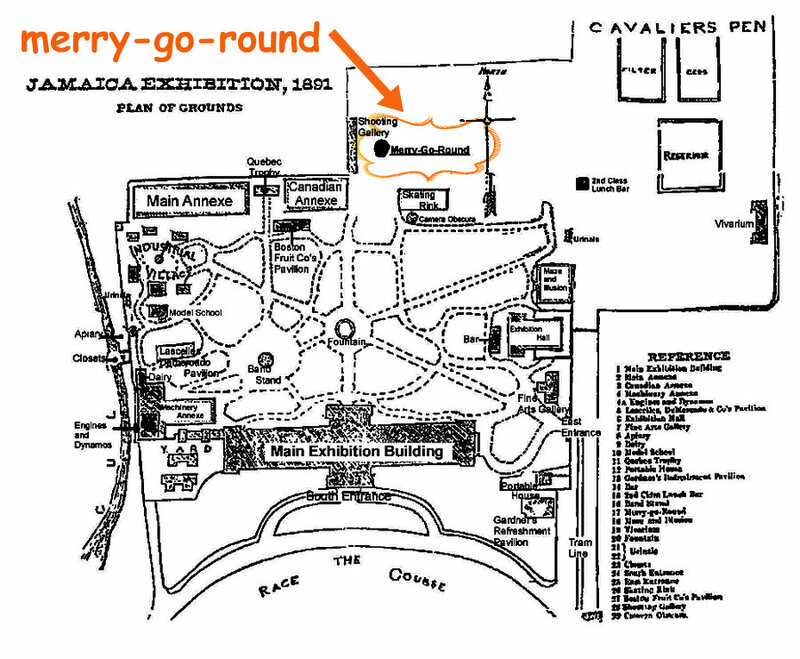 There are references in September and November 1877 which may point to the earliest appearance of a merry-go-round in Kingston. A Monsieur Gobron set up, with the permission of the Custos, what was essentially an amusement park on the south-west corner of the intersection of King and Tower Streets. 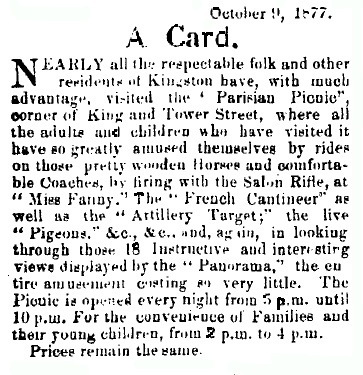 Major attractions for adults were the shooting galleries and the Panoramas of operas, but aimed especially at children was the ‘Parisian Picnic [which] consists of a magnificent Circus of Flying Horses and coaches, on and in which the most Desirable Ride can be obtained’, and this attraction is described in the advertisements as an ‘entirely new amusement’. The ride, ‘whether on Horseback or in Coach’, cost 6d for 5 minutes. Although the ride was considered suitable for both sexes and all ages, it was opened especially for children from 2 to 4 p.m. It is of interest to note that the coaches, or carriages, were part of the carousel because in those days it was not considered proper for ladies to sit astride a horse, live or wooden. One reason for assuming that these are references to a carousel or merry-go-round is that the term ‘Flying Horses’ has been a synonym for carousel up to the present day, especially in New Orleans. Also, at Oak Bluffs, Martha’s Vineyard, Massachusetts, is the ‘Flying Horses Carousel’, a National Historic Landmark, the oldest continuously operating carousel in the U.S.A., which was originally handcrafted in 1876; this tallies well with the appearance of ‘Flying Horses’ in Jamaica in 1877. The use of the term ‘circus’ in this context is confusing, but apparently the earliest American carousel in 1799 was advertised as a ‘wooden horse circus ride’. Even if these are early references to a merry-go-round there is still, however, an inexplicable gap until the next reference in 1887. Certainly the ambivalence of Jamaican society towards the merry-go-round, which became even more pronounced in the following decade, was already obvious. 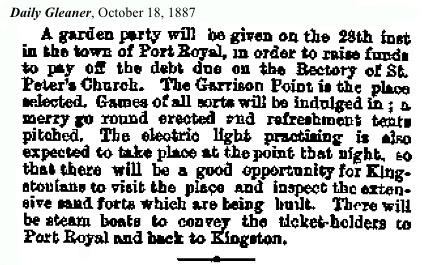 In October 1887 a Garden Party was held in Port Royal to raise funds to pay off the debt on the St Peter’s Rectory, and a merry-go-round was one of the attractions. 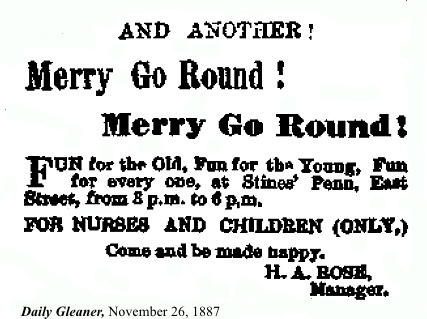 In late November H A Rose was advertising his merry-go-round at ‘Stines Penn’ on East Street, especially for children, but open to adults as well. In this complaint the terminology which was commonplace later is already established – ‘disgraceful scenes’, ‘disreputable characters’, ‘filthy language’ and ‘disgust and annoyance of respectable neighbours’. It is obvious that a general opinion among the respectable and middle-class was that merry-go-rounds were frequented by the dregs of the society; on the other hand the merry-go-round was apparently already well established as a popular form of entertainment for the working class. 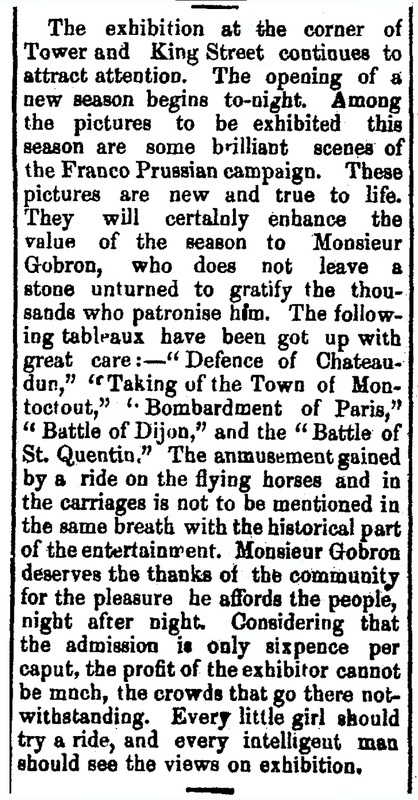 In the years leading up to the Exhibition in 1891, the patrons of the merry-go-rounds continued to receive unfavourable publicity. In early 1888 there was a complaint from householders on upper East Street about their bad language at night; in May 1888 Moxey Loza was hauled into court ‘for unlawfully blowing a horn or cornet at the performance of a Merry go round’; George Francis, who was asleep on a piazza corner of Luke Lane and could give no account of himself ‘beyond that he had been to the Merry-go-Round’ was charged with vagrancy and sentenced to 14 days’ hard labour in the St. Catherine District Prison; in September 1890 ‘Joseph Mitchell [was] charged ... with receiving and fraudulently embezzling the sum of 1/6, at a merry-go-round in the vicinity of the Race Course, the property of Alexander Reid, an Auctioneer and Commission Agent’ - he was found guilty of theft and sentenced to 14 days; George Solomon, a prominent merchant and politician, disparaged the amusements of the people as ‘merry go rounds and picnics, where there is nothing good or beneficial to be learned’; in the September before the Exhibition a non-conformist pastor reportedly warned against ‘the demoralizing influence of the baleful Switch Back Railway, and the pernicious soul destroying evils of the satanic Merry-go-Rounds’. A Gleaner editorial dealing with that last point expressed the opinion that if, as the pastor feared, ‘the majority of our members who visit the Exhibition will be drawn into the current of worldliness and sin . . . with so little temptation as is offered by Switch-Back Railways and Merry-go-rounds’, the religious values instilled into the hearts and minds of the church members could hardly be of a very robust character! We have been requested to call the attention of the Constabulary to the disgraceful behaviour of a large number of people who congregate nightly outside of the Salvation Army Temple in Church Street and indulge in the most filthy expressions, to the annoyance of several respectable persons who unfortunately reside in the locality and which tends to corrupt the minds of their children We have also been informed that a few nights ago the Revd Mr Murray who resides just opposite had to leave his house and go into the street to try and persuade these disorderly people to disperse. 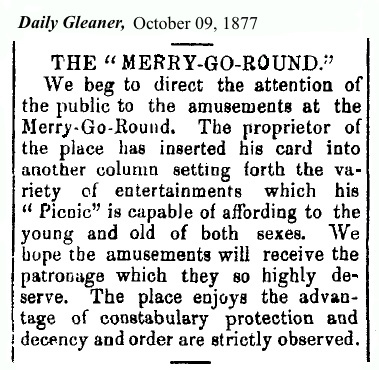 In spite of criticisms, respectable Jamaica continued to list merry-go-rounds among the attractions at Fairs and Garden Parties, and they were also offered for sale in the columns of the newspapers. In April 1890 a ‘Merry-Go-Round in thorough order, consisting of 8 Horses; 24 Carriages; 1 Elephant; 1 Donkey; 1 Rein Deer; 1 Lion.’ was advertised by Reid and Company, of 141 Harbour Street. Later in the summer of 1890 a merry-go-round used at a recent Fair and Garden Party was erected at the corner of the Parade and Love Lane, opposite the Theatre, presumably good news for children, and others, who enjoyed that form of entertainment. Of all the amusements calculated to create a crowd and to excite the fascination of the country people, the merry-go-round I think stands most prominent. Despite the cry "no money" Messrs. Saunders have done handsomely well at Asia, where they fixed up their apparatus on Tuesday last and will no doubt remain for a while to gather in the first fruits of the new year. The people adopt some curious plans to realize funds for this purpose; it is said to be so fascinating, that after one ride is indulged in it is hard work to stop or keep away from the site - I am informed as a positive fact that when the merry-go-round was at Crosskeys a man on his way from market having exhausted all the proceeds of his sale of provisions sold his donkey for half its value and spent all the money in riding. Addiction indeed! One can only speculate as to the reception that man received from his family when he reached home! From January to May 1891 Jamaicans visited the Exhibition just to the north of the Race Course, in their thousands. The picture below shows visitors using the mule-drawn street car to get to the Exhibition; the tracks had been laid down specially to serve the Exhibition. As well as the Exhibition Halls there were a theatre, a skating rink, a shooting gallery and other entertainments, as well as Louis Bopp's merry-go-round. Louis Bopp arrived in Jamaica on November 26, 1890, on the s.s. Aguan from New York. He had come in order to operate a carousel or merry-go-round at the Jamaica International Exhibition due to open on January 27, 1891. 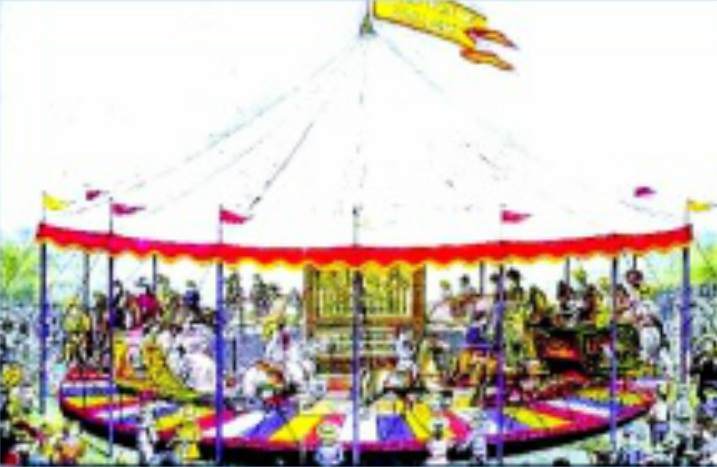 According to the Daily Gleaner Mr Bopp’s carousel ‘is of a new patent having seating capacity for 52 persons - it has 38 horses and two chariots. Some of the horses by a mechanical arrangement are made to jump. The Carousal and the organ attached will be run by steam power. There is also a dynamo attached to the machine so that the Carousal will be lit by electricity.’ He had also brought photographic equipment as an added project. His wife, Kate, and son, Louis jnr, arrived on January 1, 1891. Louis Bopp’s merry-go-round was located on the northern edge of the Exhibition grounds, which took up the area now covered by the Wolmer’s schools, and much of the Mico sports field as well. It was apparently a popular attraction for visitors to the Exhibition; on Easter Monday, March 30, 1891, over 3000 people rode the carousel, making that the best day’s business to that point. 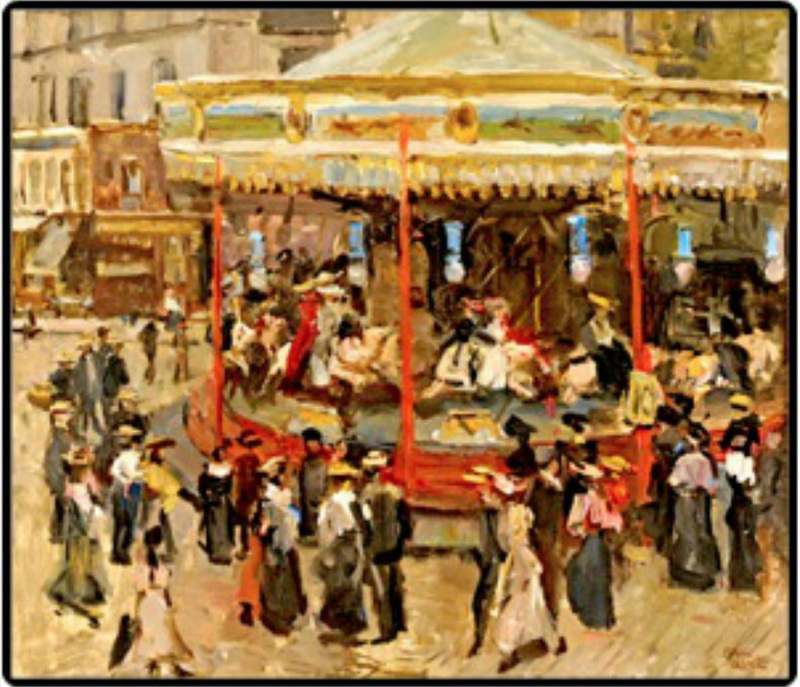 The possibility was raised of keeping the merry-go-round, skating rink and other amusements operating after the end of the Exhibition on May 2, 1891, but the substantial losses incurred in running the Exhibition made such further risks unacceptable. Louis Bopp, however, intended to carry on his business through the rest of 1891. He applied to the Kingston City Council to lease land on the Racecourse to run an amusement park, but the Council’s demand for ‘a rent of £30 per month, payable weekly and in advance’ was too steep. Although the Council later changed its mind, Bopp either bought or leased Alton Ville on Orange Street, which came on the market in June, and began to set up his ‘entertainment grounds’ there. The ‘Alton Ville Pleasure Park, Pleasure Grounds’ had its grand opening on August 1, 1891, the 53rd anniversary of ‘Full Freedom’ at the end of Apprenticeship in 1838. August 1 had always been an occasion for popular entertainments, and Bopp’s ‘Pleasure Grounds’ were ideally suited to the tradition. He offered ‘Skating, Steam Merry-go-Round, with its grand Organs, Roman Swings, Comic Lime Light Views [magic lantern shows] Aunt Sally, Cane Stand, Natural Fishing, Camera Obscura, Shooting Gallery’; a ‘Strength Tester’ and ‘Swinging Weights’ were attractions added later. Skating started at 3 pm and dancing at 7 pm, with the Kingston Volunteers’ Band providing the music, and Senor Rondon had a pavilion ‘where his usual fine quality iced cream was served’. Everything was brightly lit by ‘several electric arc lamps’ and ‘hundreds of Chinese Lanterns’. Admission was 6d [six pence] for adults, and children were admitted free when they were accompanied by parents or guardians. Advertisements stressed that ‘good behaviour and respectable appearance’ were insisted upon. The Street Car Company helpfully made arrangements to convey passengers to the grounds for one fare each way. Kingstonians were able to enjoy the delights of the gardens through August and September, after which it was announced that Bopp would tour the island. It must have been very difficult to move the equipment over the island’s inadequate roads (later there is reference to carousels travelling by sea around the island), and in the event he seems to have gone no further than Spanish Town. The engagement there was announced for one week, but even if Bopp travelled further, he was back in Kingston by November 21. The gardens were in full operation over the Christmas Holidays, and were open free on Christmas Day, but, according to an advertisement in the Gleaner on December 14, Bopp sold off much of his equipment by auction at Alton Ville. There was, however, no mention of the carousel among the articles for sale. December 24: Owing to the many enquiries as to whether Alton Ville Park was to be thrown open free to the public on Christmas day and evening, we beg to state that it is Mr. Bopp's intention to give a grand free opening on that date, when the "Merry-go-Round" and the various other amusements, so well loved by our people,'will be in thorough readiness for all desiring a good outing and lots of solid enjoyment. There is ample accommodation for the large number who will undonbtedly avail themselves of this opportunity for a day's amusement. The Bopps left Jamaica at the end of December 1891; advertisement of Alton Ville Park continued until the middle of January 1892, but after that there are no further items relating to it. It is not clear whether the steam carousel returned to New York, or was sold and remained in Jamaica. At last there appears to be some chance of a quell in the “merry-go-round" craze which has for so long been going, without restriction, the round of various districts, to the annoyance of peaceful householders. . . . These "merry-go-rounds" as conducted among the peasantry are certainly no reasonable form of enjoyment, and the sooner something is done to at least restrict the hours of riot arising therefrom the better. Between the happy family of Salvationists and the equal[ly] riotous riders of the "merry-go-round" the peace of quiet homesteads is seriously interfered with. The Merry-go round, that abominable public nuisance, has again visited us; and Mr. Rose, the proprietor, laughs while, attracted by that most atrocious drumming, the idle and ignorant feast on "rides and drives" and have their "tin" all spent.
. . . there were, as before, all sorts and varieties of sports besides the racing. As on the former occasion a “Merry-go-round ;" " Bow-so-roe ;" " John Canoe" - Cowhead dancing, perfectly indescribable as before, and other fancy dancing, all going on with the greatest good order and good temper. The association of the merry-go-round with ‘Bow-so-roe’, ‘John Canoe’ and ‘cow head dancing’, all ‘folk customs’ with a long history, seems to indicate a perception that it had become an accepted part of the culture of working-class Jamaicans.
. . . the very unseemly conduct of quite a large number of the rowdy element that congregate nightly at a merry go round at the corner of Oxford and Beeston Streets where the unwashed indulge in most disgusting language, much to the annoyance of respectable residents. Is it possible that quiet and unoffending citizens should be made to suffer nights of torture without the slightest consideration from the authorities? Of course the Mayor who sanctioned this lives away from the city, consequently it is no nuisance to him. I think the Race Course is the proper place for such amusements. A fight took place amid one of these [merry-go-round] scenes on Saturday evening last, and it is reported that one of the two parties in question (a woman) was struck and seriously hurt, occasioning the arrest of the guilty parties who are now in the jail awaiting further developments of the case. The Salvation Army itself tried to take on the merry-go-rounds; they held, as one of their meetings, a ‘Trial of the Devil’, in Savanna-la-Mar, and one of the charges laid against the devil was that he ‘owned a merry go-round in the town of Sav-la-Mar, which very nearly occasioned a murder some few months ago.‘ Nevertheless complaints of the nuisance caused by both ‘merry-go-rounds’ and Salvation Army meetings continued, and the point was raised that on occasions those who complained confused the merry-go-round drums with those of the Army. In defence of the Army it has to be said that some of the problem was caused by bogus ‘Salvation Army’ groups with no connection to the official organization.
. . . all day on Sunday the merry go-round people were engaged in pulling down their machine to pieces prior to its removal by the coastal steamer on Wednesday.
. . . this desecration of the Sabbath day and says it took place on a piece of land in the main street which belongs to the Municipal Board and is not far from the Parish Church. In general, however, it seems that, as the decade and the century drew to a close, the ever-popular merry-go-round became an increasingly respectable form of entertainment, and its money-earning potential aroused increasing interest. In 1899 Sunday School children at Mile Gully were entertained at the Rectory with merry-do-rounds and swings. In January 1900 a merry-go-round at Hope Bay drew a small crowd in the evenings and all day Saturday though ‘on account of the little money in circulation it is not likely to be long here.’ In May a picnic at Buff Bay went well except that - ‘During the operations of the merry go round the pole broke in two, causing the occupants to fall to the ground.’ Fortunately they were, however, none the worse for their fall. In June the Mechanics Association, a popular Friendly Society, put on a Gala Day at Kendal, for which special trains were run; along with sports and games, and a band and dancing, a merry-go-round was a special attraction. Perhaps most significantly, the merry-go-round became an established attraction at Rockfort Gardens, a venue for popular entertainment which was just beginning its decades-long career when it was opened on July 18, 1899. The Gardens were served by the Windward Road street car line, which ended just beyond their gates. The site of the Gardens was owned then (and still is today) by the electricity company that ran the street cars.
. . . it seemed particularly bad; the lights were wretched, the band was worse, the instruments being much out of tune, and the Merry go round making its hubbub while the band was playing. Allow me to say that that kind of thing is not likely to attract the public. The vendors of sweeties and pindars [peanuts] are also objectionable as they block the entrance to the gardens and offend one by their most unmusical cries. I beg to make a suggestion which I hope those who manage affairs will act upon. Rockfort gardens is a very desirable place of resort in the afternoon much more so than in the evening when the mosquitoes are often unbearable, I would suggest that the band play once a week from 4.30 to 7 p.m. It is then that mothers and children, and nurses and children would very much appreciate it, and I am sure that there are many who would take a drive to the gardens in the afternoon who will not do so at night. Then a rule might be made that the merry go-round only make "music" when the band is not playing. But in the same month a two-day Garden Party organised in aid of the Roman Catholic Church was very successful and a merry-go-round was a well-patronised amusement. The steam merry-go-round is having a prosperous career in Savanna-la-Mar, and bringing in, it is said, about forty pounds a week. Of course, it is a legitimate business, and I have nothing to say against the owner or owners who are working for their money. But here is an object lesson. Destitution and semi-starvation are seen on every hand. Some would say that it cannot be really so, or so much money could not be spent in this way night after night. If appearances go for anything, the people who patronize the merry-go-round are people who pay no taxes, and are neither house holders nor land owners. Then the question arises, should they not be taxed? It is evident that they can afford to pay. 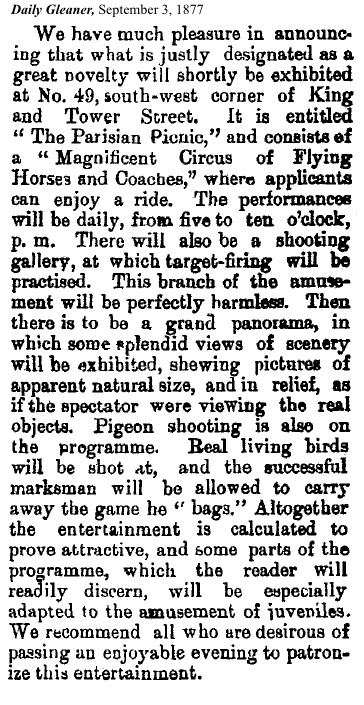 It has been alleged that hundreds of pounds have already been earned by this very amusing sport and the only reason why the present owner is parting with it is on account of his inability to attend to it himself. Evidently a good living is in store for any one who is desirous of going after the investment. Enthusiasm for merry-go-rounds as a form of entertainment continued well on into the new century, but with less and less of the character of a ‘craze’ which it had had in the 1880s and ‘90s. In part this was probably because of a widening range of amusements such as roller-skating, moving pictures, cycle racing, vaudeville performances, ‘practice dances’, which were being added to the traditional working class recreations. Another question was as to the value of the merry-go-round. They found it in 1898 on the Race Course. It was knocked about for two years, and then they found Mr. DaCosta advertising it for sale in the newspapers. Advertise as they liked, no-one would purchase it then. It was put up at public auction, and finally they found Mr. Nathan purchasing it. Mr. Nathan transferred it to Mr. Morgan, the plaintiff’s husband. It was sent to Linstead and other places, and Mr. Nathan was to get £62, and up to then they found that the amount had not yet been paid. It was stated that £63 was spent on the merry-go-round, but he would submit that nothing like this was spent. They found that it was a merry -go-round that would not go round, as no one would patronize it, so the plaintiff thought she would send it to sea to encounter a whirlwind, and then claim an exhorbitant sum greatly in excess of its value. Perhaps the merry-go-round business was not always a very profitable one! Unfortunately this popular amusement sometimes led to unpleasant consequences. A number of accidents were reported. In March 1913 Myrtle Bell of Buff Bay sued David Muir for injuries received from a fall from his merry-go-round. Adella Bell, plaintiff’s mother said her daughter came home on the night in question covered with blood and with one tooth broken. She had to be taken to a druggist who extracted the broken tooth for which he was paid 8/. Her daughter earned 12/ per week as a dressmaker and she was unable to work for 2 weeks on account of the accident. In December the same year two accidents occurred in the Comfort Hall district. At Waterloo a lad got his wrist bones broken while turning a merry-go-round. A fatal accident took place at Epping Forest where a picnic was kept with free rides on the merry-go-round. A boy named James Harriott was riding and finding the speed too slow, he left off riding to put on more power for a swifter ride. In the act of doing this the trunk of his body got between a board and the handle with which the "go-round" was turned and the force with which the handle came to his body broke the backbone and death followed shortly afterwards. Lacovia, Jany. 3. -The young life of Wilford Wright, of about 12 summers, suddenly ended on Saturday night at about 8.30. This boy with a crowd of other people was enjoying a ride on a Merry-go-round erected for the season. In attempting to stop the spinning of the merry-go-round, it is alleged his neck caught between some parts of the fixtures and was so badly crushed that he succumbed a few minutes after being extricated. A great crowd soon gathered and the police ordered that the body should not be removed. Dr. Johnson of Black River, the D.M.O. was summoned and a post mortem examination was performed. The remains of the unfortunate boy were laid in their last resting place, on Sunday. The Salt Spring gully came down in full force washing four small houses out to the sea. It tore up trees and fences that lay in its path. The merry-go-round which has been on the gully land at the back of Mr. Gruber's house for the past week was swept away. And there were still those who objected to the business with complaints such as - ‘The general cry is, "hard time," and "want of money," yet the manager or master of the merry-go-round has been hauling in the cash here since last week.’ In Savanna-la-Mar the old conflict with the Salvation Army still survived: in 1908 the police brought a case against the Army for a disorderly meeting. One issue was the noise of the drum, but it was suggested by an Army witness that the drumming that was heard came from the near-by merry-go-round. Oddly it was also stated that the Army had purchased one of the big drums from the merry-go-round. Occasionally riding a merry-go-round was helpful in a legal case. In 1902, Robert Williams, accused of taking part in a riotin Montego Bay, was successfully alibied by friends who said they had seen him ‘enjoying himself at the merry-go-round while the riot was going on.’ More often the link was less happy. In 1904 there was a report about people coming down from the merry-go-round on the Kingston Race Course late in the evening being mugged by a gang at the top of John’s Lane; comment was made on the failure of the police to patrol the area. In September 1911 Joseph Williams was sitting quietly among some country people on the Spanish Town Road around 9.45 p.m. and told them that there was a merry-go-round not far off and if they wanted to go and ride he would take care of their products. Constable Campbell of Smith's Village, who was watching, arrested him for vagrancy, for which he subsequently received 14 days' hard labour. In November 1911 Irene Miller objected to Manasseh McCartney’s advances while she was enjoying a ride on one of Kingston’s merry-go-rounds. A fracas ensued, involving the mothers of the two young people. Three of the combatants were arrested and later fined 5 shillings each in the Police Court. On the whole, however, it seems that behaviour around the merry-go-rounds improved as the century moved on. The improved behaviour may have resulted partly from the increased popularity of Rockfort Gardens which was increasingly Kingston’s main entertainment venue. A wide range of activities took place there, but the merry-go-round remained a perennial favourite. Not to say that the behaviour there was always exemplary! The musical (?) instrument attached to the merry-go-round at Rockfort Gardens has for long been a source of annoyance and pain to visitors who possess a sensitive ear. When we are entertained with a solo from this instrument the effect is disagreeable enough in truth. But when an attempt at concerted music with the W. I. R., or any other band is made, the result is most disastrous. To my mind it is nothing short of an insult to a splendid band like that of the West India Regiment or the Italian flagship to let loose a vile, discordant machine, within earshot of the bandstand, and while the band is performing beautiful music. Might I suggest to the management of the Gardens that on those evenings when a band is performing, the round-about and its offensive adjunct be kept going only during the intervals in the programme. An alternative suggestion, which I throw out for what it is worth, is that the ancient "box of sounds" might be presented to the Museum of the Institute of Jamaica. When this writer suggested ‘that the ancient “box of sounds” might be presented to the Museum of the Institute of Jamaica’, almost suspiciously on cue a new organ was installed on the merry-go-round on September 19th. One can only hope its tunes were more appreciated! A new roller-skating rink was opened on the same day. Festivities at the Gardens continued; Wesley Chapel had its Garden Party there in January 1908, rather than at Myrtle Bank hotel as in previous years. St Anne’s Catholic church had its August 1st picnic there in 1910, and in both cases the merry-go-round was high on the list of attractions. The organizers of the Wesley event made it clear, however, that the merry-go-round would be operating before and after but not during their concert. A city store offered tickets to the Gardens and the merry-go-round to boost its sales; Rockfort was certainly the most popular entertainment venue in Kingston at that time. There were some problems. Just before Christmas 1908 some officers from a Cuban ship broke into the merry-go-round enclosure and started it up as the Gardens were closing. No one got their names and no legal action could be taken against them. In 1911 a young man was charged with collecting fares for the merry-go-round without authorization, but was acquitted. Another charge arose from a fracas in 1918 which occurred when two men collided getting on and off the merry-go-round, but the matter was settled amicably when the offending party apologized and agreed to pay £5 in compensation for wounding the other man with a knife. On the whole behaviour at the merry-go-round seems to have been orderly. By Saturday morning a part of the Common on the roadside had been thoroughly cleaned, and beautifully decorated with flags, the Union-jack, the King, the Queen and ma[n]y others, flapping in the cool sooth wind. Booths were erected on the grounds for the convenience of the musicians and others and in a corner was erected a merry-go-round, on which the children greatly enjoyed themselves. A New Year's picnic will take place on New Year's Day at the beautiful lawn of the 'Mulberry Ground' in connection with the Excelsior school, Spanish Town, of which Mr. Edwards is principal. A merry-go-round and other games will form the attraction of the day. Mr. Bryant's band from Kingston will be present. Beside the attractive refreshment booth there will be entertainments on the grounds such as continuous acrobat performances, promenade concert, games and merry-go-round. A free entertainment will be given in the theatre which will specially amuse the children. The admission will be as follows: Adults 1/, Children 6d. Among the special attractions will be: Merry-go-Round for children, band concerts and mystic bower from which may be obtained a mystic flower, which, when unfolded, will disclose wonders. In succeeding decades merry-go-rounds continued to be an attraction, though mostly for children. They appeared at local fetes and shows, and were also brought in by foreign amusement park operators. Objections were successfully raised to the permanent location of merry-go-rounds in urban areas but attempts to limited the length of time they could stay in each town seem to have been unsuccessful. There were, unfortunately, accidents from time to time, occasionally involving fatalities. The merry-go-round continued popular into the second half of the 20th century, the early ‘merry-go-round craze’ completely forgotten. When about forty years ago the first merry-go -round came to Jamaica, the peasants went mad about it and spent every threepence they could procure on merry-go-round rides. There was an outcry against this at the time, but these so called extravagant and foolish people were not stinting themselves of food, they were merely enjoying themselves more than they did before, and in order to have some luxury along with the simple necessities that had sufficed them they gave less time to indolence and more to productive exertion. Daily Gleaner, May 26, 1928, page 12 editorial.